If you tow a trailer, follow these instructions because driver and passenger safety depends on proper equipment and safe driving habits. Towing a trailer will affect handling, braking, durability, performance, and fuel economy. Never overload vehicle or trailer. Consult an Authorized Mazda Dealer if you need further details. Do not tow a trailer during the first 1,000 km (600 miles) of your new Mazda. If you do, you may damage the engine, transaxle, differential, wheel bearings, and other power train components. 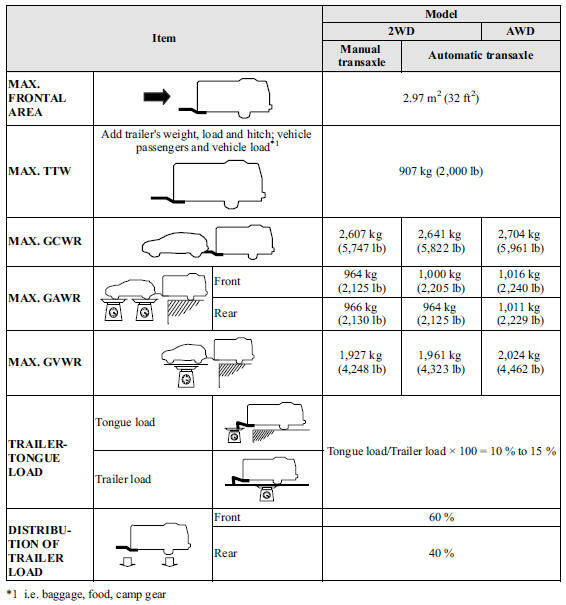 The total trailer weight (TTW), gross combination weight rating (GCWR), gross axle weight rating (GAWR), trailer load, and trailer tongue load must be within the prescribed limits. l The total trailer weight (TTW) is the sum of the weights of the trailer load (trailer weight plus cargo), trailer hitch, vehicle passengers, and vehicle load. Never allow the total trailer weight (TTW) to exceed specifications in the Trailer Towing-Load Table. • The maximum GCWR is the combination weight of the trailer and load plus the towing vehicle (including trailer hitch, vehicle passengers, and load). It must not exceed specifications in the load table. Do not exceed front and rear GAWR (gross axle weight rating) and GVWR (gross vehicle weight rating). If you do, vehicle handling, braking, and performance will be affected. These values are also on the Motor Vehicle Safety Certification Label posted on the driver's door frame. In a high-altitude operating environment, a gasoline engine loses power at a rate of 3 % to 4 % per 304 m (1,000 ft) of elevation. In these conditions, a reduction in gross vehicle weight and gross combination weight is recommended. Because vehicle weights vary, adjustments must be made to meet the requirements in this table. Attempting to tow loads greater than those specified is dangerous as it may cause serious handling and performance problems that could result in personal injury or vehicle damage, or both. Loading the trailer with more weight in the rear than in the front is dangerous. Doing so could cause you to lose control. The trailer tongue load must be 10 %―15 % of the total trailer load (sum of the weights of the trailer and cargo). Attempting to tow loads without determining the total trailer weight and tongue load is dangerous. Trailer sway from crosswinds, rough roads or other causes could result in loss of control and a serious accident. The total trailer weight and tongue load can be determined by weighing the trailer on platform scales at a highway weight station or a trucking company. Use only a hitch ball recommended by the trailer manufacturer that conforms to the gross trailer weight requirement. When not towing a trailer, remove the trailer hitch (if detachable) to reduce the possibility of damage as a result of the vehicle being rear-ended. An unsecured trailer hitch is dangerous as it causes greater trailer sway from crosswinds, rough roads or other causes, resulting in loss of control and a serious accident. Examine all trailer-hitch mounting bolts regularly and tighten any that are loose. If the hitch is removed, seal any open mounting holes to prevent exhaust, dust, water, dirt and other foreign elements from filtering in, possibly endangering personal safety and damaging your vehicle. Do not install a hitch that stiffens the bumper as it will reduce the bumper's performance. Modifying your vehicle exhaust system is dangerous. Exhaust gas entering the vehicle could cause loss of consciousness or even death. When mounting the trailer hitch, make no modifications to the vehicle exhaust system. ● Make all hitch adjustments with actual loads. Do not load and unload vehicle while adjusting hitch. This action will change the vehicle height. ● Do not use an axle-mounted hitch. This may damage the axle and related parts. When towing a trailer, make sure all tires are inflated to the recommended cold-tire pressure, as indicated on the tire pressure chart on the driver's door frame. Trailer tire size, load rating, and inflation pressures should conform to tire manufacturer specifications. Using the temporary spare tire on your vehicle when towing a trailer is dangerous as it could result in tire failure, loss of control, and injury to vehicle occupants. Safety chains must be used as a precautionary measure should the trailer become unintentionally unhitched. They should cross under the trailer tongue and attach to the hitch. Leave enough slack to allow full turns. Consult literature published by your trailer or hitch manufacturer for more details. Towing a trailer without using a safety chain securely attached to both the trailer and the vehicle is dangerous. If damage occurs to the coupling unit or hitch ball, the trailer could wander into another lane and cause a collision. Trailer lights must comply with all federal, state, and local regulations. Equip your trailer as required before towing it day or night. Do not connect a trailer lighting system directly to the lighting system of your Mazda. This may damage your vehicle's electrical system and lighting systems. Have a recreational vehicle dealer or trailer rental agency connect the system, and inspect the brake lights and turn signals yourself before each trip. If the total trailer weight exceeds 450 kg (1,000 lb), trailer brakes are required. If your trailer has brakes, make sure they comply with all federal, state, and local regulations. • Verify that your Mazda maintains a near-normal attitude when a loaded or unloaded trailer is connected. Do not drive if it has an abnormal front-up or front-down position. Inspect for incorrect tongue load, worn suspension parts, and trailer overloading. • Make sure the trailer is properly loaded and the cargo is secure to prevent it from shifting. • Make sure the mirrors conform to all government regulations. If they do not, install required rear view mirrors appropriate for towing purposes. The three main causes of vehicle-trailer accidents are driver error, excessive speed, and improper trailer loading. • Have your cooling and braking system checked by an Authorized Mazda Dealer. • Before starting out, inspect the operation of all vehicle and trailer lights and all vehicleto- trailer connections. Stop and re-inspect all lights and connections after driving a short distance. • Your Mazda will handle differently with a trailer in tow, so practice turning, backing, and stopping in a traffic-free area. • Take time to get accustomed to the extra weight and length. • Allow more room between your vehicle and the one in front because braking distance increases with a trailer. For each 16 km/h (10 mph) of speed, allow at least one vehicle and trailer length between your Mazda and the vehicle ahead. • Avoid sudden braking. It may cause loss of control and result in jackknifing, especially so on wet or slippery roads. • Shift the shift lever to the D position when towing a trailer in hilly terrain or when heavily loaded. The D position will allow operating the vehicle without frequent shifting. Avoid quick lane changes, sudden turns, and tight turns. Slow down before turning to avoid the need of sudden braking. A turning trailer will make a tighter arc than the tow vehicle. Compensate with turns that are larger than normal. Plan well ahead to pass other vehicles, and provide plenty of room before changing lanes. Crosswinds from passing vehicles, especially larger ones, and the effects of rough roads will affect handling. If swaying occurs, firmly grip the steering wheel and reduce speed immediately, but gradually. Steer straight ahead. If no extreme correction of steering or braking is made, the combination of less speed and firm steering will result in stability. Backing a vehicle with a trailer requires practice and patience. Back slowly, and have a helper outside at the rear of the trailer to reduce the risk of an accident. To turn the trailer, place your hand at the bottom of the steering wheel and turn it in the direction you want the trailer to go. Make only slight movements to prevent sharp or prolonged turning. Shift into a lower gear to reduce the possibility of overloading or overheating the engine, or both. Shift into a lower gear and use engine compression as a braking effect. Holding the brake pedal down too long or too frequently is dangerous as it could cause the brakes to overheat and lose power, resulting in loss of control and a serious accident. Use lower gears to help reduce speed. Pull off the road and allow brakes to cool down whenever braking performance feels reduced. The extra weight of the trailer may strain the engine on hot days and on long or steep upgrades. If the temperature gauge indicates overheating, turn off the air conditioner, drive safely to the side of the road, park off the right-of-way and wait for engine to cool. Refer to Overheating . Always make sure the tires of the trailer and the tow vehicle are blocked while parked. Apply the parking brake firmly and put the transaxle in P.
1. Depress and hold down the brake pedal. 2. Have a helper put wheel blocks against the downhill side of all vehicle and trailer tires. 3. Then release the brake pedal slowly until the blocks bear the load. • If the grade is downhill, turn the steering wheel so that the front of the front tires face the curb. • If it is uphill, face the rear of the front tires against the curb. 4. Firmly apply the parking brake. 5. Shift the transaxle into P, and stop the engine. 3. Release the parking brake (also the foot brake) and pull away from the wheel blocks. Stop; apply the parking brake and shift into P.
4. Have a helper retrieve the wheel blocks. Trailer towing causes higher fuel consumption. If you tow a trailer frequently, have your vehicle serviced as shown in Scheduled Maintenance .